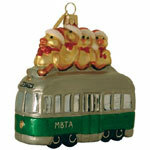 The Boston MBTA Green Line Trolley ornament measures 2.5" tall. Boston is home to the oldest public transportation system in the nation -- in fact, established in 1631, the system is even older than the country itself. At the time, mass transit consisted simply of a family-operated ferry service. The city and its public transportation system grew rapidly and by the 1880s riders complained the streets were so congested they could reach their destinations faster by hopping out and walking along the roofs of all the stalled vehicles. This led to the development of Boston's subway system in 1897 -- the first of its kind in North America. The articulated streetcar also originated here in 1912-13 in response to the challenge of navigating Boston's maze of narrow streets. The Massachusetts Bay Transportation Authority or "T" is currently one of the largest public transit systems in America, carrying well over a million riders every weekday. This year we have given our MBTA Trolley a face-lift! Now decorated in a fine iridescent glitter, this little trolley sure sparkles and shines as it hangs on your Christmas Tree! 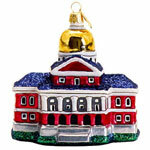 An adorable keepsake of your trip to Boston. 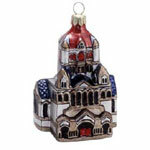 Hand-blown and hand-decorated in Poland. 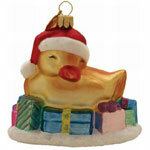 Each Landmark Creations ornament is blown by mouth and often takes a week to complete. After blowing, the glass is silvered, rinsed and then turned upside down to dry. The silver is applied on the inside, which allows a gorgeous depth of color. 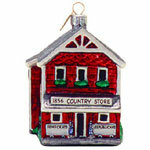 Once the ornament is dry, the decorating can begin. Different artists are responsible for applying different colors and details. 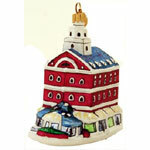 When the ornament is fully detailed and has been allowed to dry, the neck is trimmed and crowned with an ornament cap.